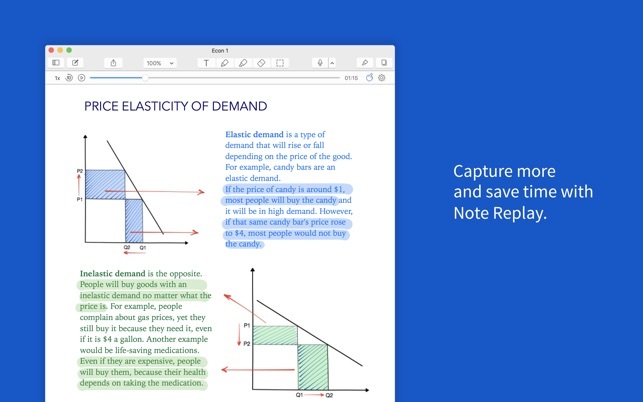 Welcome to Notability: powerful, yet wonderfully simple note-taking and annotation. Apple's Mac App of The Year! Apple Editors' Choice on iPad, iPhone, and Mac! 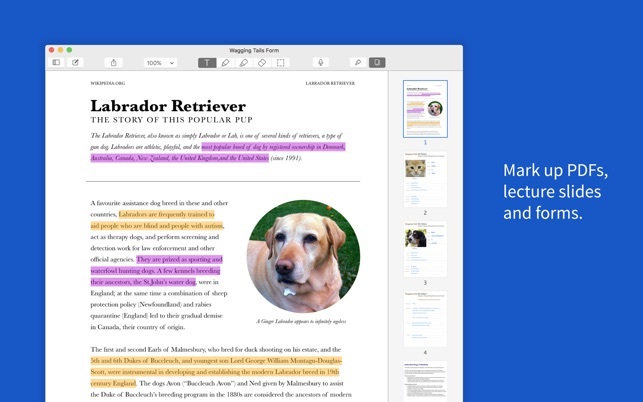 • Quickly create and edit notes by dragging and dropping documents, photos, or audio recordings from the desktop. • Get more done with keyboard shortcuts. • Secure and lock your notes using Touch ID. • Multi-Note lets you open multiple notes at once in new windows. 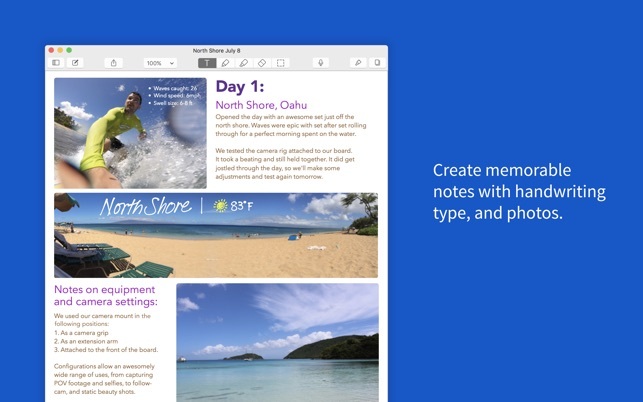 • Easily access your recently opened notes in the Recent Notes subject. 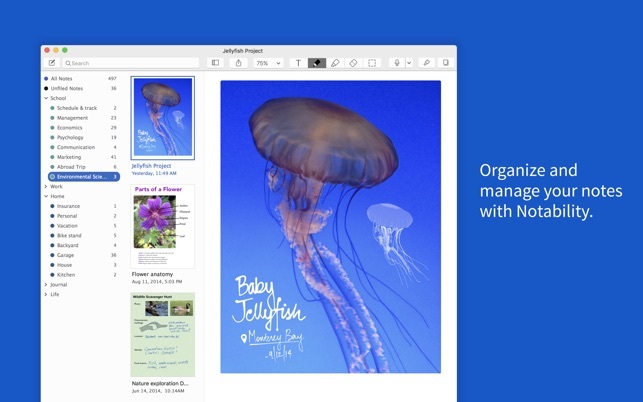 • Notability includes full-featured, left-aligned typing with a wide range of fonts, sizes, and colors. • Handwriting has been fine-tuned to be smooth and expressive using a trackpad or mouse. • Ink can be scaled, transformed, rotated, nudged (with arrow keys), and restyled. 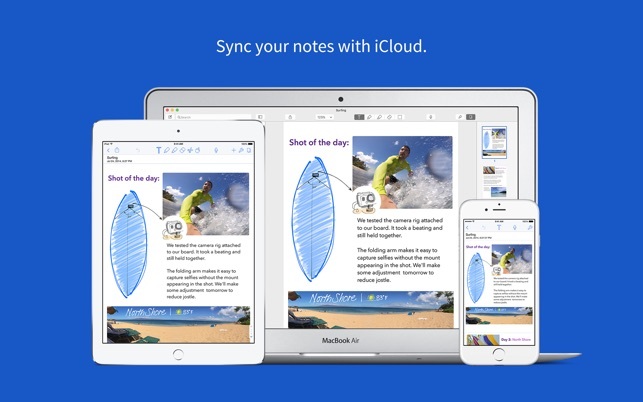 • Share notes via email, AirDrop, Dropbox, Google Drive, Box, OneDrive, and more. • Use Auto-backup to send your notes to a cloud service for archiving or recovery. Dropbox, Google Drive, Box, and OneDrive are all supported! I’m updating this review because of the version 3 update. It now recognizes handwriting very well. I haven’t thoroughly tested it but the problem I had was fixed and seems to be very good. I’m not sure how well the conversion works and if it converts the text and saves it in the note for the iPad version to then be able to search too, but I’ll find out soon. ORIGINAL REVIEW: I think the app has great potential with a just a small amount of work. The app should match the abilities of the iPad version. The Mac version cannot convert the handwriting to text after it’s selected like you can do on the iPad. If you can it’s not obvious. It would also be nice if you could right click on the pictures that were taken with the program and save them as a JPG. The option now is to copy it to the clipboard, open it in another program such as Preview and then save. It seems to be a poor workaround. It does sync very well with iCloud and I found it backs up just fine to Dropbox (iPad version). It will only allow one device on your account to back up. I’m not sure why unless it considers a backup just another sync. So I started using this app about a year ago and loved it at first. It's a great app with lots of very useful features. However, the problem I had and couldn't ever get anyone to help resolve is that it doesn't always synchronize correctly. If you don't use the iCloud Sync feature then you are fine using this app. I'll try to explain. Using the app on multiple devices and using the iCloud Sync feature if I would enter text in a note on one device but then switch over to another app too quickly, I would lose all of the text or most of it that I entered. So if I didn't go right back to the note again, I never knew that I lost it. Something to do with the sync on iCloud wouldn't work. I thought that maybe I had to shut the app off on all of the other devices, so I did that. Still didn't work. So if the notes you're putting into Notability are important to you, I would make sure everything is syncing correctly because it may not be. I lost a lot of stuff over the past year and probably more than what I know of. I use the Notes App now and it's working great. It doesn't have the features that Notability has but it does sync everything very nicely! I just wanted to say, "thank you" for continuing to improve this app. You could very easily do the bare minimum and retain the loyal customers you do have. After all, I use this app daily (on my iPad). So, I'm not likely to go about purchasing and learning a new system, simply because the app doesn't have a particular feature. I'm sure you know this. Yet, happily, you continue to add features. The main features I was excited about were (a) the ability to choose my own colors, and (b) the increased zoom levels. If I may propose an idea for a possible future feature: the ability to mix page styles within the same document. For example, the ability to have one page with lined paper for basic notes, while the next page is blank to allow for mind mapping or freehand drawings, while the next might be graph paper. This would be quite helpful. As for now, you all are doing a great job. Thank you!